This September comic book fans are celebrating the fiftieth anniversary of the X-Men. Since their September 1963 debut, the group of mutant super heroes (and their on again, off again villains) have been involved in some of the best and most memorable stories that Marvel has published. It’s amazing that the franchise, which has spun off countless movies, video games, cartoons, toys and other merchandise was almost cancelled due to low sales in 1970. Fortunately, the Cockrum/Byrne/Claremont era began around 1975 and the series has been a mainstay since. So why have the X-Men lasted so long and have been so successful? The main theme has been about the desire of proving that no matter how different you are, you can be a productive member of society. At one point, everyone has felt insecure about their place in the world, and how they have to work harder to prove to everyone that they belong. The other theme is about inclusion and diversity. That doesn’t need to be explained. Just look at the all-time roster of the X-Men, having come from different races and cultures, some from different planets. And those are just the differences on the surface. But the point is that we are all mutants people, and everyone deserves to be treated equally. 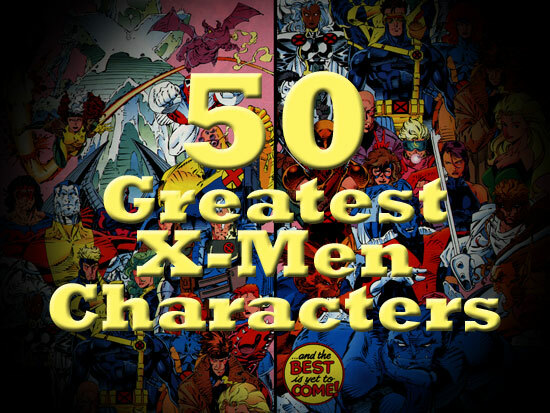 So to celebrate this, I’m going to be blogging the fifty greatest X characters. This should be fun and I can’t wait to see your responses. This entry was posted in Uncategorized and tagged 50, comics, marvel, x-men by Chris. Bookmark the permalink. Also Cyclops, Karma, Dani, Surge, Rockslide, Dust, Anole, Wolfsbane . . . lots more. With Angel right near the bottom. Somewhere below Maggott. Because Angel is useless. We’ll see where everyone ranks and who doesn’t rank. I won’t spoil it, but I have a pretty compelling argument for Angel not being useless. And I have basically the entirety of the ’60s and ’70s, and a solid chunk of the ’80s, for Angel being so useless. Hilariously so. The guy got captured by a trio of crows. They weren’t mutant crows or anything. They were just some loser’s trained birds. Anyone who actually gets captured by pet birds deserves to be mocked for it for the rest of time. He was useful as Archangel, though. Wolverine should be in the top 5 if not number 1 .